Beginning this fall semester, Georgia State students’ sustainability fee was raised from $3 to $5. Where exactly is that money going? For starters, the Office of Sustainability has recycled 32 percent of the university’s waste so far in 2018 and has saved the university $21,437. The program manager, Jenni Asman, began conducting waste audits in the fall of 2017, where student interns counted items that they found in the trash around the university. During this process, they found a significant amount of Styrofoam. Georgia State is one of just three universities in the nation to have the machine. 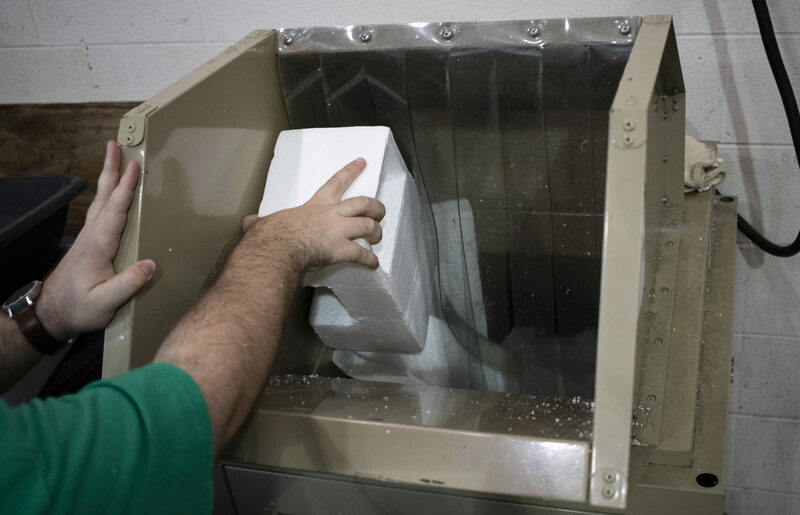 The densifying process is possible because Styrofoam consists mostly of air. “We can have three big trucks worth of Styrofoam and once it is densified, it comes out to about the size of a small brick,” she said. This brick is given to Caraustar, a paperboard mills company, which then creates picture frames from the material. The Center for Hard to Recycle Materials (CHARM) is a center that does exactly what its name suggests: recycle things like batteries and other material that can’t be recycled easily (like paper). When CHARM lost the ability to recycle Styrofoam, they reached out to Asman for help. “The entire surface level of the stadium was filled with Styrofoam. We had students and the recycling crew densifying for hours. It was so cool, and the students loved it,” Asman said. One of the student interns on the project, Jennifer Duenas, said that the experience has taught her a lot about sustainability and a lot about the Georgia State campus. “It’s really about crunching numbers. Calculating the waste accumulated each month, how much was diverted from landfill and how much money we saved in the process,” she said. Duenas said it’s a very hands-on experience with recycling, from densifying styrofoam to digging through trash, but there’s more to it than just that. She actually thinks looking through the trash is cool. In 2013, Asman was the only staff member in the office, and the projects focused solely on reducing power usage in buildings. “Prior to creation, there were initiatives that faculty took on, but there was not a central hub to bring these ideas to fruition,” Asman said. Asman said moving departments really helped the office grow. “We were now able to have a better connection with housing, campus services and PantherDining,” Asman said. Since the move, the department has completed several initiatives but still finds difficulty in management with such a limited amount of funds. “We run the office on a shoestring budget,” Asman said. Staff salaries and a majority of the operational costs come from state funding. The remaining funding comes from fundraising, grants and student fees. Asman said that some schools, like the University of Georgia, use sustainability fees to fund office support and staff salaries. One of the recent projects was possible through a $380,000 grant to the office. The result was newly updated LED lighting in T Deck that cut energy consumption and the utility bill in half annually, according to Asman. Carrie Freeman, a researcher of environmental communications at Georgia State, participated in a $40,000 grant-funded curriculum workshop in 2014 where over 60 faculty members learned how to infuse sustainability concepts into any class. She said that today, society is facing many problems as a community including mass extinction, pollution and climate change. “Given the urgency of the current environmental crisis that affects all living beings on our planet, institutes of higher education owe it to students in all majors to raise and engage their environmental literacy skills,” Freeman said. Freeman said that teachers should include information on sustainability in course material, and researchers can find work toward environmental problem-solving. “Every student can choose to do some class projects on eco and animal protection topics, as well as joining student groups to network and take collective action on these issues,” she said. Several student-proposed initiatives have seen success as well, including the bikeshare program, solar picnic tables and a hydroponic freight farm behind the PantherDining center at Piedmont North that grows lettuce. Asman said it takes more than just individual effort to achieve sustainability goals.